A group of community activists want Metro to stop or at least slow down construction of a mixed-use, affordable housing development planned for Mariachi Plaza in Boyle Heights. 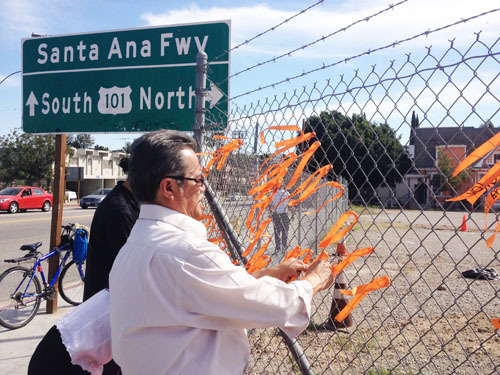 They took their protest to the iconic plaza last Friday, where the small group of residents, students and affordable housing activists tied about 600 ribbons — spelling out “Save BH” — to the metal fence surrounding the site of the future development, an empty lot at the corner of 1st Street and Boyle known to locals as Mariachi Plaza West. Written on each of the ribbons was a comment from a local resident stating what they would like to see built on the lot, ranging from open green space to a soccer field or a public parking structure. It’s the second time is recent months that groups protest development plans for Metro-owned land near Metro’s Gold Line Station at Mariachi Plaza. Friday’s rally was organized by the Coalition to Save Mariachi Plaza and students from CALO YouthBuild Charter School in Boyle Heights. They claim Metro and project developer McCormack Baron Salazar failed to engage the community in the planning process and they want more outreach to the community before construction of the Santa Cecilia Apartments begins. “There’s a lot of concern because these major projects [are] coming in and the community doesn’t really have a say on how … or what they should look like,” Mynor Godoy, chair of the Boyle Heights Neighborhood Council Planning and Land Use Committee, told EGP. Metro approved the housing project back in 2009 but it was put on hold due to financing issues, according to Metro spokesman Dave Sotero. Those issues have since been resolved, he said Tuesday. When built, the Santa Cecilia Apartments LLC development will include 80 affordable housing units and 4,000 sq. ft. of ground level retail space. Sotero told EGP that the project would be 100 percent affordable housing, noting that Metro is one of the biggest providers of affordable housing in LA County. “The agency has more than 1,700 affordable housing units either completed, in construction or in negotiation at its joint development projects countywide,” added Sotero. Some seniors and young people may not meet the low-income requirement to qualify, said Boyle Heights resident Baldomero Capiz in Spanish. The owners of several local businesses said they are worried the new development will make parking in the area even tougher. Erika Gomez owns Yeya’s Restaurant, located across the street from Mariachi Plaza. She told EGP the biggest concern for businesses on 1st Street is the severe parking shortage. “We just have two street parking spots; one is for 20 minutes and the other is [only] for unloading,” she said. She thinks the neighborhood would be better served if the lot was turned into a public parking lot or parking structure. However, Vivian Rescalvo, director of Countywide Planning and Development for Metro, told EGP plans for the project have been finalized and construction on the Santa Cecilia Apartments at 1750 E. 1st Street would begin by the end of March and take about 16 months to complete. Last Friday’s protest comes on the heels of public forums where gentrification and the need for more affordable housing in the area have taken center stage. Rescalvo said the residential complex will target families making 30-60% of the median income in Los Angeles. For example, she said, a family of four with an income of $16,000-$24,000 will pay about $550 a month for a two-bedroom apartment. A family of four making $33,000-$48,000 will pay about $1,100 for the same apartment, she explained. Applications for the new apartments will not come out until “the building is ready or almost ready,” she said. Sotero said planners took into consideration parking concerns and included 88 parking spaces in the development for housing and seven more for retail. Robert Zardeneta, director of CALO YouthBuild and a member of the coalition, said Friday that their goal is not to oppose this specific project “because community members have mixed feelings about the proposal,” but to delay the groundbreaking until there is community engagement on the part of Metro and the developer. A lot of time has passed since the housing development was approved and “many of us had no idea this project was ready for construction,” he said. People need to know what’s going to take place during construction and after, he explained. While the bones of the development cannot be changed, developer McCormack has agreed to hold public meetings to get input from the community as to the types of businesses they would like to occupy the retail spaces, according to Rescalvo. The meetings are in keeping with Metro’s “new process to engage the community” prior to beginning development construction, she said. Councilman Jose Huizar’s office will be involved in the public meetings, which should take place in the next week or two, Huizar spokesman Rick Coca told EGP. Coca said that the development proposed by Metro for Mariachi Plaza [East] was “poorly handled by the Metro agency” and “that’s not what the community wanted. In that case, facing strong community opposition, Metro agreed to halt the Mariachi Plaza East development and to conduct public meetings within the next six months to get input from the community. Godoy said that Metro can’t just have communication with the developer and ignore the community. “If they are willing to say they are starting from scratch in Mariachi Plaza East, they should do the same thing here,” he said.